Here are the facts, based on the American government’s own data about what kids eat and the levels of pesticides they are exposed to in their food. 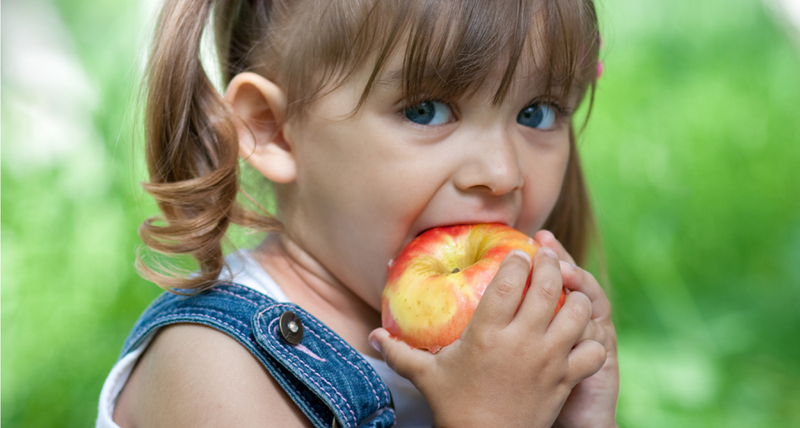 Preschoolers are more heavily exposed to pesticides than adults because they eat more of certain foods that are sources of pesticides: 30 times more apple juice, 21 times more grape juice, 7 times more orange juice. Government tests show that raspberries, strawberries, apples and peaches grown in the United States and cantaloupe from Mexico are the foods most contaminated with pesticides. The least contaminated fruit are watermelon, bananas, kiwi, pineapple, and domestic canteloupe, but organic food, grown without the use of chemicals, is the safest choice of all. Young children pick up pesticides not only in their food but also playing on the ground and floor – increasing their risks. The special needs of children for protection against pesticide exposure was recognised in the passage of the Food Quality Protection Act (FQPA) of 1996. The FQPA changed the standard by which the EPA determines pesticide tolerances, (the highest amounts of residues allowed in food). The most important changes were new requirements for the protection of infants and children from pesticide damage to their developing neurological and reproductive systems. “The FQPA was a good law, but the EPA’s determination to enforce the law has withered under industry pressure,” says Todd Helterbach, of the Environmental Working Group (EWG). A report published by the EWG on pesticide abuse called “Attack of the Killer Weeds”, also states “the EPA has yet to implement the full children’s health requirements of FQPA for even one of the approximately 300 pesticides that are used in more than 20 000 products. • Buy organic food and products wherever possible. • Don’t let your kids play on lawns treated with pesticides. • Remove shoes, Japanese style, in your home. Pesticide residues cling to shoes and are transferred to your carpet where kids and pets play. • Keep any pesticides used in and around your home in a safe place, or better yet, switch to non-chemical ways to handle household pests. • Even the staid Consumers Union, publisher of Consumer Reports, has called for a ban on risky pesticides that are unsafe for children, whether used on food, in homes, at schools, or in other places where children are likely to be exposed. This entry was posted in articles and tagged children, Pesticides.